What’s on the menu? A normal question in an eatery, so at Kwartelenmarkt 11 too. But you’ll find no menu here. As far as possible, we work with daily fresh produce and, on that basis, surprise you with a varied offering of pure flavours. Roel Welles will tell you at the table what he can dish up for you. If there are certain ingredients that you don’t want to or cannot eat, he will of course take that into account. In that way, on every visit to Kwartelenmarkt 11, what you’re going to eat will be a surprise. Vegetarian dishes possible. In consultation with Roel, we’ll make it a feast based on fresh ingredients. Have allergies or special diet needs? Tell us and we’ll naturally take them into account. Together with you, Roel will put a personal menu together based on daily fresh produce. – Bavette of grain-fed beef with black peppers, green tea, cane sugar and coarse sea salt, then cooked as roast beef. Thinly cut on the slicer and served with Dutch cabbage lettuce, fried mushrooms and a basil vinaigrette. – Potato fritters fried in rapeseed oil served with fillet of smoked salmon from Lebouille, a gently cooked farm-fresh egg, cabbage lettuce, crème fraiche, built up in layers and finished with a basil dressing. – Quail prepared in 3 ways on quickly cooked asparagus, spaghettini, fried quail egg served with a veal jus with truffles. 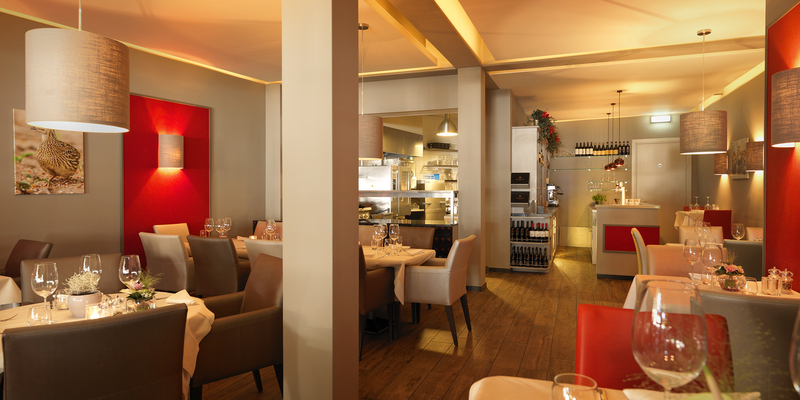 – Grilled fillet of sole with baked lettuce, mushrooms, marinated Tasty Tom tomato blocks with a truffle mayonnaise. – Poached egg crisply baked with green and white asparagus with a sauce of cep and freshly grated chestnut mushrooms. – Lobster bisque whipped up with chervil, tarragon and vanilla marrow with fried fresh fish. – Giant prawns cooked in garlic, , quenched in teriyaki sauce, served on mushrooms, green courgette and quickly fried thick cut wild onion. – Sunfish from the griddle, served on wild spinach with a frothy lobster sauce and basil oil. 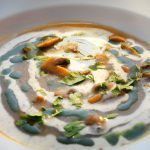 – Lightly bound wild mushroom velouté, truffle crème, finely sliced leaf parsley and freshly ground black and white pepper. – Lean rolled tenderloin of grain-fed beef filled with tarragon, served with a béarnaise sauce, fries of the agria potato and fresh vegetables of the season. – Daily fresh fish prepared in various ways with asparagus from Roel’s parents’ own field, sauce of reduced white wine, lime, lemon grass assembled with crème fraiche, pasta with basil and grated grana padano. – Entrecote of veal with gently cooked veal cheek, green vegetables and asparagus served with the jus of the veal, fried mushrooms and frites with home-made mayonnaise. – Whole quail from the spit sprinkled with its own dripping stuffed with thyme and fried leek, grilled asparagus with a jus of quail with truffles (minimum preparation time 50 minutes). – Medallion of Belgian Blue double-muscle beef from the sirloin, grilled on charcoal, red onion braised with Romanesco cauliflower and a sauce of truffles and cep. 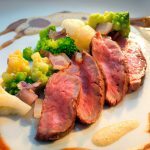 – Fillet of tame duck breast fried on the fat, glazed with honey, broccoli braised with a hint of garlic with oxtail jus. – Fillet of skate fried in rapeseed oil, baked white cabbage with red onion sauce of North Sea shrimps and oil of sweet basil. – Cappuccino of strawberries with vanilla ice cream prepared with fresh milk from cheesemakers Mertens topped with a crème of sweetened cream dusted in cocoa powder. – Hot and creamy chocolate tart with heavenly mud based on the recipe of Roel’s grandmother, home-made vanilla ice cream and a sauce of caramelised cane sugar. – A fine selection of cheeses from Kaas en Kaasjes with pitted white wine grapes, nut & fig bread and fig chutney. – Nectarines poached in white wine with vanilla, with a creamy vanilla ice cream and a crème of yoghurt from the kettle of cheesemakers Mertens. 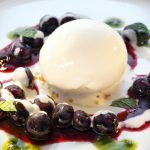 – Marinated blueberries in port syrup, yoghurt ice cream and a cold champagne sabayon met Tahiti vanilla. The above prices are per person and exclude drinks. If you want to reserve for today, please call 077-303 10 23 and we’ll be happy to reserve a table for you if possible. If you send the reservation form on Sunday or Monday your reserve will not be handled until Tuesday. © Kwartelenmarkt 11 - All rights reserved.